Teens, music, and pizza! What could be better? Pizzastock 2.5 is a community-wide event celebrating youth, music, and fun while raising mental health awareness and suicide prevention to the teen and young adult population. 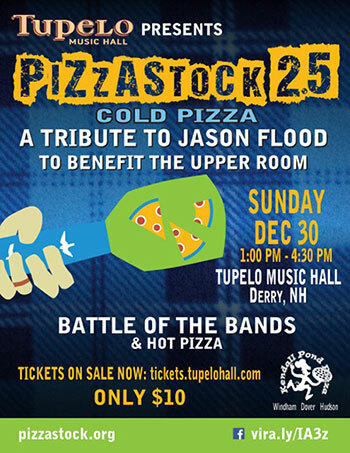 Pizzastock was launched in 2017 as a way for the Flood family to connect with local youth and honor the memory of Jason Flood. Jason was a Pinkerton Academy graduate, musician, and athlete who passed away by suicide in 2016. The show will feature 4 local New Hampshire based bands comprised of High school and College aged kids competing for the title. The house band and talented solo acts will keep you entertained throughout the afternoon. There will be raffles baskets and silent auction items up for the win. Kendall Pond Pizza, the official Pizza provider for Pizzastock, will provide fresh slices for sale. All proceeds from sales will go directly to The Upper Room. The Upper Room is a family resource center here in Derry and is currently working on programs specifically designed for teens and young adults to raise awareness and prevent suicide.